Friday, June 28, 2019 at 10 a.m.
​Registration required. To register, email guydenny@centurylink.net. Please note your registration. You will not receive an email confirmation. Naturalists Judy Semroc and Larry Rosche, co-authors of the Cleveland Museum of Natural History's Dragonflies and Damselflies of Northeastern Ohio, are two of the foremost experts for identifying odonates in Ohio. They will be leading a wading field trip of the Clear Fork of the Mohican River to discover and identify dragonflies and damselflies of central Ohio. No limit on the number of participants, but you must sign up. Sign up by emailing Guy Denny at guydenny@centurylink.net. Please include your cell phone number if you have one so we can stay in touch in the field if needed. We will meet at 10:00 a.m. at the parking lot at the junction of State Route 97 and State Route 3 in Ashland County just about 2-3 miles south of Loudonville, Ohio. We will actually be wading in the Mohican River, so make sure you have old tennis shoes or wading shoes to wear - not boots. Pack a lunch and water. In case of rain, we will reschedule the field trip to Monday, July 1. Sunday, May 19, 2019 at 10 a.m.
​Registration required. To register, email guydenny@centurylink.net Please note your registration. You will not receive an email confirmation. 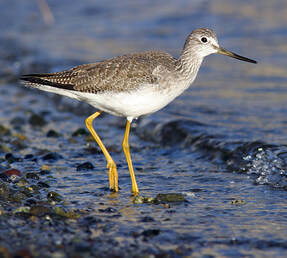 Leader Jason Larson, naturalist, expert birder, and Director of the Richland County Park District and Gorman Nature Center, will lead a shorebird identification field trip to several of his favorite sites along Lake Erie during the peak of spring shorebird migration. This field trip will last well into late afternoon. Plans are to visit several shorebird sites before noon, eat lunch at Jason’s favorite local restaurant, and then head out to do more birding at Magee Marsh Wildlife Area. 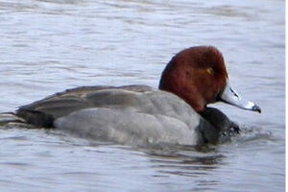 Directions: Meet at the Ottawa National Wildlife Refuge Visitor Center, 14000 OH-2, Oak Harbor, Ohio. Mentor Marsh gets attention from Valerie (left) and Randy (far right) under the direction of Ben (CMNH). ONAPA has been busy this winter with several winter stewardship projects. Unfortunately the weather has not always cooperated, so we had to postpone or cancel a few projects. 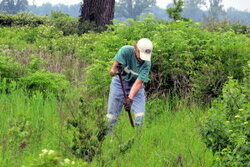 We have been getting some important work accomplished at a number of preserves and other natural areas. 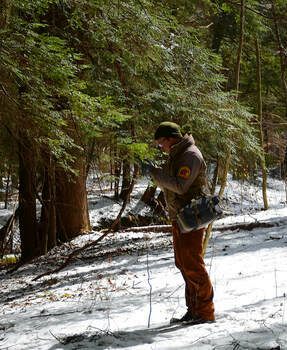 We did more hemlock woolly adelgid surveys at Crane Hollow (February 26) and Little Rocky Hollow (March 6), fortunately not finding any HWA at either site. 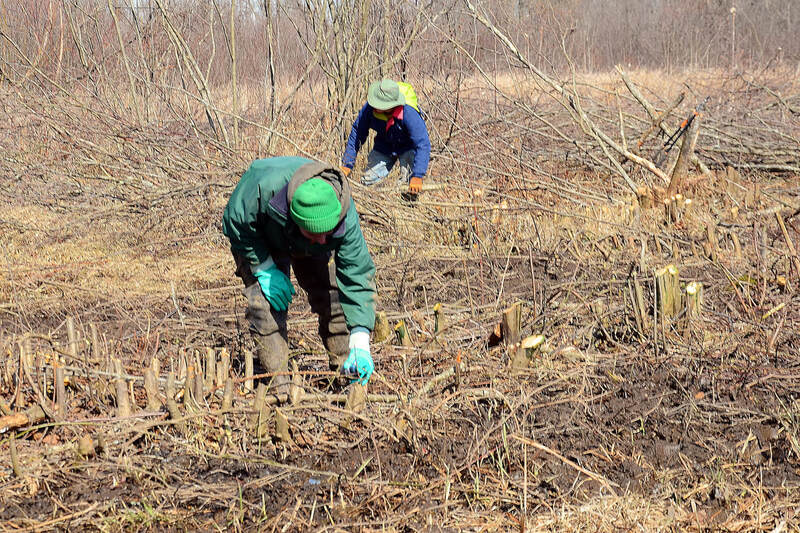 We worked at a couple of sites for Eastern prairie fringed orchid, improving habitat by removing woody species - Killbuck Marsh Wildlife Area (February 28) and Mallard Club Wildlife Area (March 12). 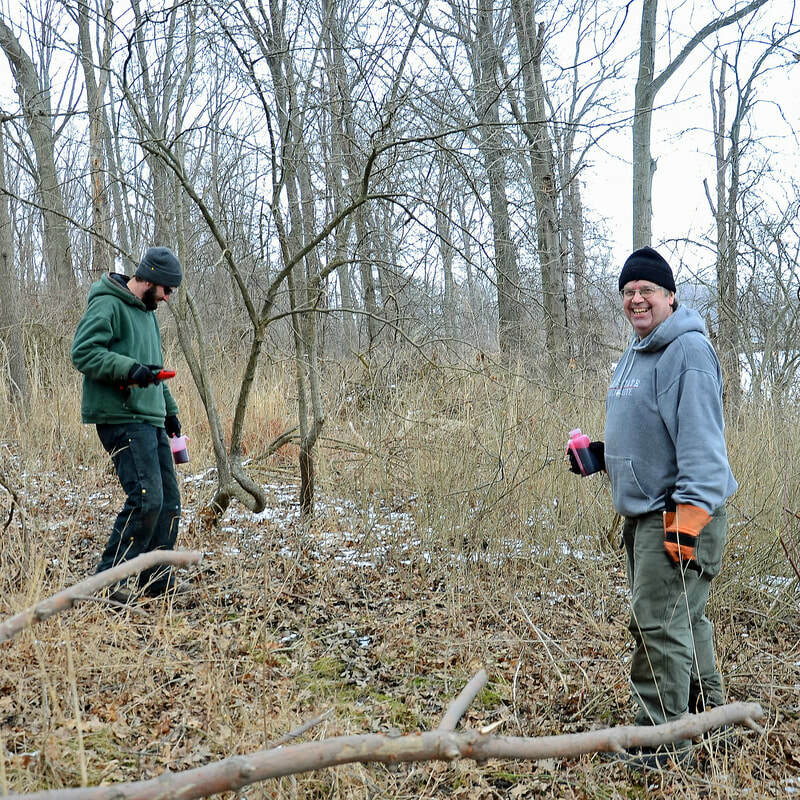 We also removed bush honeysuckle and other woody invasives in the woods at Mentor Marsh (March 7th) in cooperation with the Cleveland Museum of Natural History. 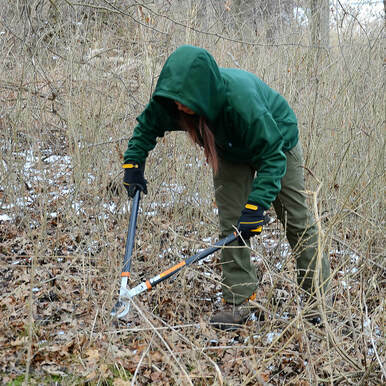 While our volunteer groups have been small this winter, we have accomplished good work at each project. Little Rocky Hollow SNP is a permit-only preserve that volunteers have the opportunity to explore during an HWA survey. 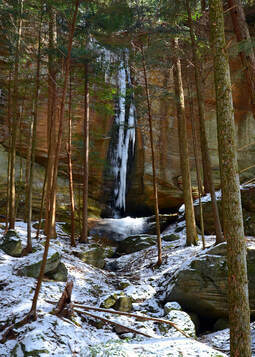 The hemlock forest is nestled among rugged sandstone cliffs. Brad examines branch for HWA. 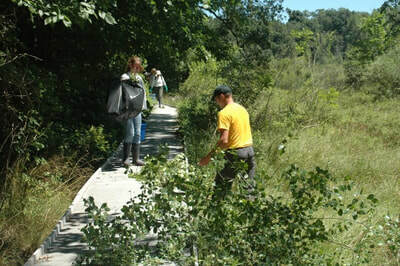 (Above) ONAPA helps treat woody stems at Killbuck Marsh Wildlife Area and (right) Mallard Club Wildlife Area. 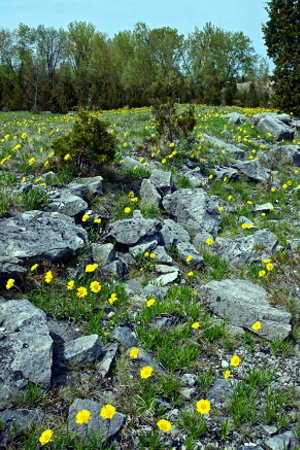 Both sites provide habitat for prairie fringed orchid. at Goslin Nature Center at Alley Park, south of Lancaster. Planning for speakers & field trips is in progress. (Photo courtesy of Lancaster, OH, Parks and Recreation). ONAPA is looking for new stewardship assistants this year! To qualify, you should be a recent college graduate with a background in biology or natural resources. The part-time position will likely run from May-November. For more information and to apply, please click HERE. Descriptions for Summer 2019 are HERE. To sign-up for April through August, click HERE. We have several stewardship projects planned for 2019, some of which are again on weekdays this year. 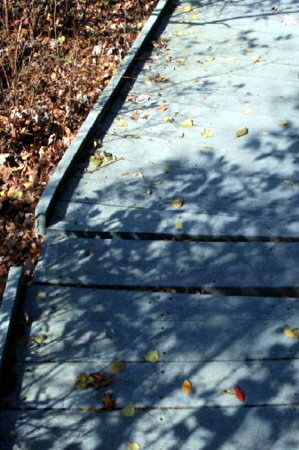 We will include a short field trip on each project to see some of the preserve we are working at. RSVP HERE. The 2019 ONAPA member field trip schedule can be found HERE. Please remember to RSVP in advance so that we can plan accordingly. Not a member? Join HERE. 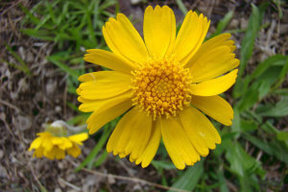 Any state nature preserve in your area can be visited and a report completed to help inform ONAPA and the preserve managers about the condition of the preserve. Click HERE for information. 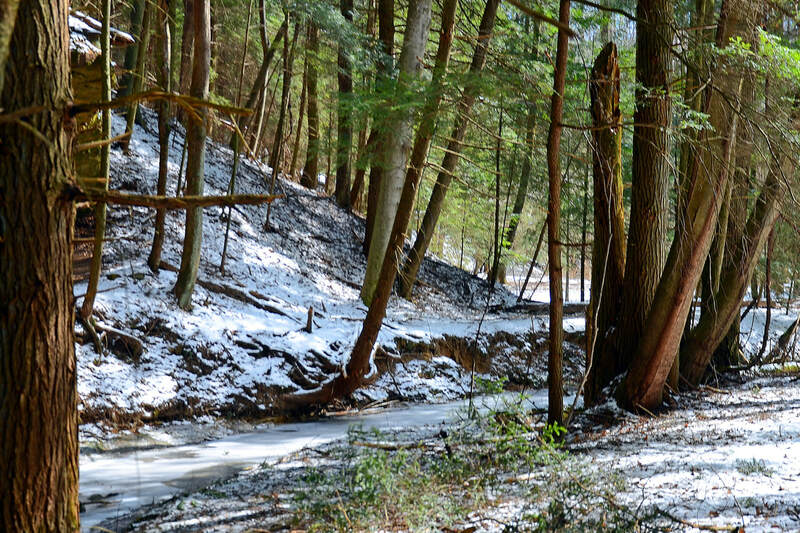 Help us help Ohio's natural areas and preserves by becoming a member today by using PayPal! ONAPA is a 501(C)3 Ohio, volunteer run organization. 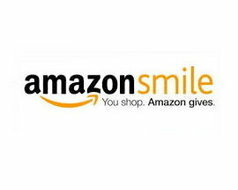 Your donations are fully tax-deductible. Donate today using PayPal. We have many volunteer opportunities available throughout the year. Invasive control, preserve monitoring, etc. 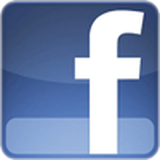 Socialize with us and join the conversation HERE. 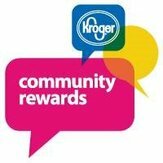 If you shop at Kroger in the Columbus area link your Kroger rewards card to us and we will benefit from your purchases. Learn more HERE.